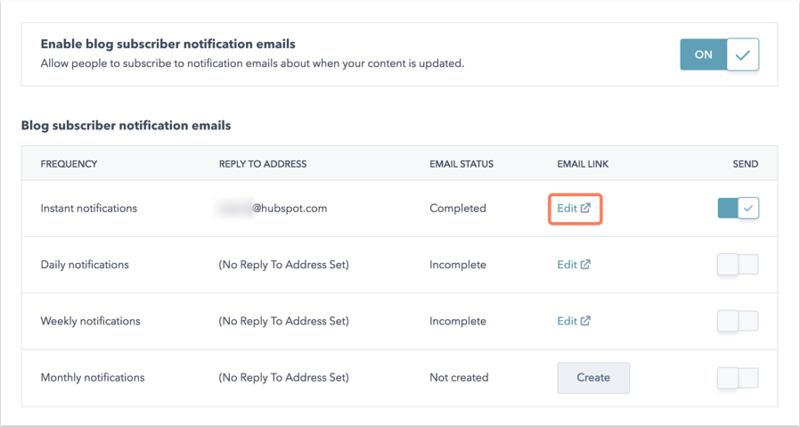 Setting up your blog subscription options in HubSpot lets your readers opt into instant, daily, weekly, or monthly notifications about your new blog posts. Your subscribers can also follow you on social media, which will allow them to see when you auto-publish your blog posts to Twitter and Facebook. Your HubSpot blog subscription forms are created automatically when you create a new blog in HubSpot. Follow the steps below to set up your default HubSpot blog subscription form. If you want your subscribers to opt in to your blog notifications through another HubSpot form, be sure to add a blog subscription field to your form. Click the name of your blog's form to edit it. By default, the blog subscription form will be named Subscribe to [Blog name] Notifications. Once you're in the form, click the Notification Frequency field on the right. In the Field options section of the left sidebar menu, click Add options to add subscription options to the form field. Hover over any existing options you wish to delete and click Remove. The field options you select should match the frequencies in your blog subscription settings. In the event there is only one option, you can opt to hide the field and pre-select that option so the contact is not required to fill this information on the form. When finished, click Publish in the top-right corner. 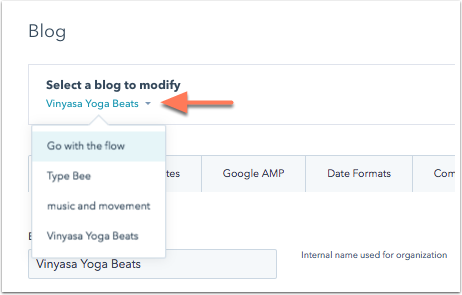 Use the Select a blog to modify dropdown menu to select which blog you're setting up. If you only have one blog, you'll only see one option in the dropdown menu. Toggle the Enable blog subscriber notification emails switch on. Please note: the notification frequency options you select should match the field values in your blog subscription form. Instant notifications: subscribers receive an email of your latest post as soon as you publish it. There is a 15-minute grace period prior to notifications actually being sent, so if you decide to unpublish a post during this period, the notification emails will not be sent. Daily notifications: subscribers receive a daily digest of your blog posts. You control the maximum number of posts per digest and the time of day it will go out. The email will include any new posts since the last notification email, up to the maximum number set. Weekly notifications: subscribers receive a weekly digest of your blog posts. You control the maximum number of posts per digest and the day and time it goes out. The email will include any new posts since the last notification email, up to the maximum number set. Monthly notifications: subscribers receive a monthly digest of your blog posts. You control the maximum number of posts per digest and the day and time it goes out. The email will include any new posts since the last notification email, up to the maximum number set. Please note: when instant blog notifications are enabled, an email will be sent out for any blog posts published within the past 12 hours. Enabling daily, weekly, or monthly notifications will include any existing blog posts published within that timeframe. Number of posts in RSS feed: enter the number of posts you want to show in your RSS feed. Each RSS email will only include new posts since the prior send of the email, up to the maximum number you've chosen. 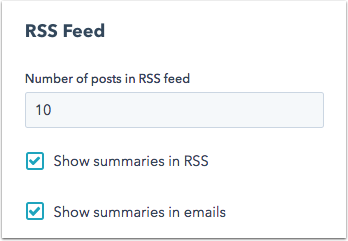 Show summaries in RSS: select the checkbox to show a preview of your blog post content in your RSS feed. Show summaries in emails: select the checkbox to show a preview of your blog post content in your RSS emails. In the Email Status column, you'll see whether the notification emails you've enabled are Completed or Incomplete. In the Email Link column, click Edit for any Incomplete notification emails you want to send. Or click Create if the default email has been deleted. Select a new From name and email address from the dropdown menus. By default, the blog notification email will be set up to Use latest blog entry headline as email subject. If this checkbox is not selected, you can compose your own custom email subject line. If the Show summaries in Emails setting is enabled, the main body of your blog post will pull into the body of your email up to the Read More tag. Click the main body of your email to edit the options for the blog content module. In the left sidebar panel, select a Post display options to choose a layout for your RSS email. 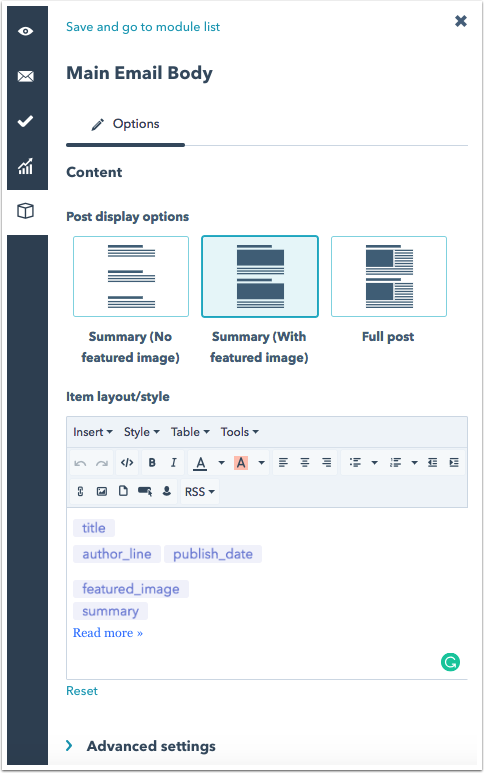 You can customize the layout and style of your blog feed in the Item layout/style editor. You'll see auto-populated RSS tokens here that you can move around and customize in the editor. Click Advanced settings to edit your author line text. 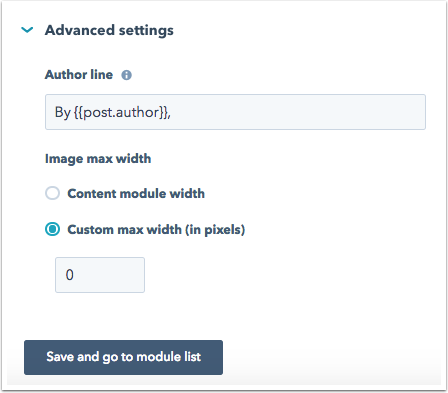 You can also set the max width for your featured image to match the width of your email content module, or set a custom max width in pixels. Click Save and go to module list to save your changes to the main email body. When you finish editing your email, navigate to the Schedule tab and click Publish or Update. After you've finished publishing each blog notification email you'd like to send, click Save to apply your blog subscription settings. Please note: your blog subscription emails count towards your email send limit.